Last month we brought you new handsets – this month we bring 4G SIM Plans! Australians are very excited about the launch of 4G services and with good reason. The 4G LTE (Long-Term Evolution) voice network is the fourth generation of cellular technology. This is great news for mobile phone users. Performance-wise this means less buffering, better audio quality, improved gaming experience and smoother streaming services with reduced lag. Currently, 4G networks in Australia run on FD-LTE (Frequency Division), which uses two separate frequency channels, one for data traveling in each direction. TD-LTE (Time Division) is a new flavour of 4G technology, where the upload and download of data happens on the same frequency, but at different times. For the tech boffins amongst you, check out this link to explain the ins and outs of 4G. In layman’s terms TD is another way 4G can be delivered at lightning fast speeds. Right now, there’s 4G coverage in selected areas of most major capital cities and some regional centers. Other areas of the country will follow so stay tuned. In the meantime, you can use our coverage map to check areas with 4G coverage. Of course, you’ll need a 4G capable handset to be able to make calls or use mobile internet on the 4G network. Our 4G handset range includes Samsung Galaxy S4 and Samsung Galaxy Note II. If you happen to be passing through an area that doesn’t have 4G, your phone will use the available 3G or 2G networks instead. As always, the speed you experience on the network will be a combination of the spectrum of the network you access, your personal device and the number of customers using the same network at the same time. Whether you need just a SIM, or if you want to buddy up your plan with a 4G handset, you can find a mobile phone to suit your browsing needs and desires. There are four mobile phone plans from which to choose. All plans offer call and text value, as well as a monthly data allowance. With each plan, you can enjoy great included value, and depending on the plan you choose, you could also benefit from all-inclusive national calls, texts and iiNet-to-iiNet mobile calls within Australia. There is a once-off upfront cost of $20 for the SIM card. To review all the detailed goodness on our plans just visit our 4G mobile plans website. If you want more than just a mobile, check out our Mobile Combo package where you can combine all kinds of snazzy services like superfast broadband, home phone and modem rental into a package from only $104 a month. I’ve already got a handset, can I just have a SIM? You sure can. They cost $20 each which you can purchase via our website and we’ll post it out to you. You’ll need to review our critical information summary so you’ll know all the ins-and-outs when you purchase the SIM only. 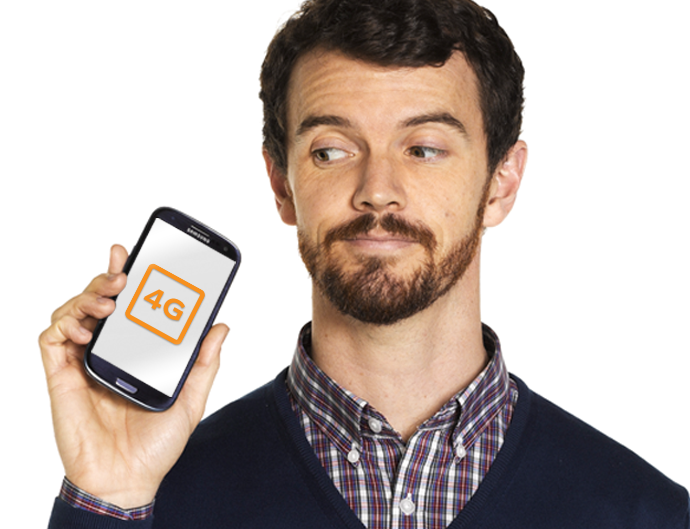 Already on a 3G mobile contract with iiNet and want to upgrade to 4G? We’re all about the upgrades. To enjoy 4G speeds you’ll need to change from your existing 3G plan to a new 4G plan. You can do this through Toolbox or call 13 19 13. Just be sure that you have a compatible 4G handset. I’m in a contract but want to join iiNet’s 4G party when I’m ready. Can you remind me? We’d love to. Just fill out a Registration of Interest form and we’ll let you know when your existing contract is nearly up. To take advantage of 4G, you’ll need to upgrade to one of our current mobile plans as they’re the only ones that currently have access to the 4G network. You can do this through Toolbox or give us a call on 13 22 58. Nice on iiNet! Quick question, do you guys have data bulk on packs like Optus does? I find that I am a huge data user but not so much on the talking yet all companies seem to correlate data and voice together with the cost. What if I just want the bare bones on voice (say $200) but want 3Gb on data? Currently our mobile plans come in the four flavours available on our website. We don’t have separate plans for heavy users of a particular type of content, however we may consider that in future plan revisions. It’s great if you can cause heavy users like myself find 3gb isn’t enough. Hi which network do you use andcan i keep the same phone number? We use the Optus wholesale 3G/4G network for our mobile services. You can port your current number over to our services as well. I can only use my mobile phone if I’m out and about in the car (ok I guess the word “mobile” is appropriate in my case) ..however if I could get mobile reception I could do away with the fixed line internet service. any chance of that being remedied? If you’re a current customer of ours we can definitely help look into improving the quality of the network in your area by either lodging faults or providing feedback to our wholesaler. Give our support team a call on 13 22 58 and we’ll do what we can to assist. Why can’t you be upfront and put the cost of calls on this page along with the rest of the plan info? Why do I have to go to another page only to find this detail is in VERY small type? Are your plans that expensive that you need to set a trap? Our web design team have chosen to present a summary page of all the mobile plans with the details of each plan’s included call rates accessible from the page through the relevant links. I’m currently with vodaphone how does your mobile coverage compare to them? I’ll have a word with our product manager about this, however I would say that part of our agreement with our wholesaler would allow us to utilise any new or improved network access. Does your plans have 24 month lock in contracts ? If so what are the cancellation fees ? SIM only plans and outright handset purchases come with no lock-in contracts and have no break fees. Any handset on a 24-month repayment would only need to pay the total of the remaining repayments if cancelled before completing the repayment. Can I access the 4 g network on this phone? Does the iphone 5 support 4g? I’m not a Samsung user and wondered if iinet are considering offering iphones in their mobile packages? The iPhone 4S does not support 4G networks however the iPhone5 is capable of connecting to 4G using a Nano SIM. I work remote where Telstra is the only provider, is iinet available on Telstra lines? Our mobile services utilise the Optus network, however landline and ADSL services are possible on off-net (wholesale) equipment operating on Telstra’s infrastructure. Does the Call Credit include international phone calls and texts? Thanks. The included call value of our 4G plans includes international SMS (Texts from Australia to an international number) but not international voice calls. Is there an option to buy extra data ? For example, can I buy the $60 plan and increase the data to 5gb for an extra fee ? We currently don’t offer data packs or any options for additional data on our 4G mobile products but we’re always looking to add more value to these plans where possible in future. Keep your eyes on our pages for any announcements. If your ADSL service isn’t currently under a contract you’ll be able to add one to your service when signing up for the mobile voice plan to receive a discount to the plan’s monthly cost. The plan best suited for each service is best determined by how much each mobile is used and what it’s primarily used for. I’d suggest checking out our plans and seeing which one is most likely to cover any current usage for each service. The 4G plans and combo packages only include the Voice plan itself. Any monthly handset charges would be on top of this. Anyway, i’m wanting to bring both myself and the wife over to iinet, preferably the $30 Casual Conversation Sim Only Plan but i’ve got a few questions i’m trusting you could answer please. 1) I have an iPhone 5 so i’m right to say that i will get 4G in a 4G area on it? I.e Perth City? The wife has an iPhone 4 so she will only get the 3G as she has been all along. 2) Most importantly, i’ve been searching high and low on your site to no avail on the above mentioned plan, if it is a month to month/pay as you go style thing, or a locked in contract for a period of year(s)? At this point in time we are NOT wanting a locked in contract, and so prefer a pay as you go/month to month style thing. I’m hoping the above mentioned plan is exacly that? You’ll be glad to know the BYO Mobile plans come with no fixed terms or contracts for the service, you’re billed in the same month-in-advance fashion as your broadband and phone plans. If you haven’t already, I’d strongly suggest getting in touch with our support team on 13 22 58 to ensure that our wholesaler is aware of any issues with the network in your area and have us assist in rectifying any other problems. Why are you hiding the Call “Rates” :-/ ??? Does it cost (credits)$5 per minute to make a phone call??? How the hell is anyone supposed to make sense of a plan that has no call rates? Also, very important, What are the fees and penalties when going over the limits??? Your marketing needs a lot of help. Oh, sorry, maybe you are trying to capture “the fools” and turn them into loyal happy customers some how. my 3G service through Optus (on an iinet contract) has severe limitations. I can cope with the simple area-related lack of service but what is really annoying is not being able to get a signal in some shopping arcades in the city – Hobart. What are my options for getting out of 3G and into, say, a 4G service inside my present contract or can I change up to a 4G contract before my present contract expires. The current contract you have is only applicable to your telephone handset. If you have a 4G enabled phone and are in a coverage area we’d be more than happy to change you over to one of our new 4G plans. If you have a contracted non-3G handset on a repayment, you would need to either purchase a 4G enabled handset outright or you could finalise any remaining repayments for the existing handset and commence a new repayment plan. Our billing and sales teams would be more than happy to assist you with any of the options I’ve mentioned. Hi Natalie, when the OptusMobile network is congested do OptusMobile customers receive priority voice and data connections over wholesale customers like iiNet customers? Being a current OptusMobile customer is it possible to port to iiNet without changing my nano SIM? Thanks. iiNet’s heavy use plan is $9 cheaper than my $69 Timeless BYO Plan and iiNet includes calls to 13, 1300 and 1800 numbers. Just to verify that iiNet’s Heavy use plan includes unlimited voice calls / FaceTime calls, SMS, MMS, VoiceMail deposits / retrieval in Australia? Thanks. iiNet’s access to Optus’ voice network is exactly the same priority as an Optus customers would experience. For Mobile broadband, we actually take it up a level and manage the data component in our network so we can offer some exciting new plans and services in the near future, as well as provide a great data experience. A credit check is only required if you’re adding a handset to a Mobile Voice plan. A BYO plan or purchasing the handset outright can avoid any relevant checks. Generally we may need a credit history removed before we can add a phone handset repayment to your service. However it’s always best to discuss any available options with our sales team on 13 19 17. We’re always trying to improve our plans to make them more appealing or competitive. Feedback such as this always helps us identify any improvements we can make to the products we offer. If you’d like to pass this and any other feedback though our website (http://www.iinet.net.au/customer-service/) our business improvement team will be sure to take it into account in future assessments and revisions of our plans. I live in Perth and have a new Samsung S4 on a $20 plan with iiNet. I would like to upgrade this to the $30 4G plan and also upgrade our existing home modem (BoB2) to 4G. How should I go about this? Changing to the new 4G plans can be done through our Toolbox or by contacting our billing team. You won’t need to change your SIM and should only have to reboot your phone once the 4G services are activated on your service. I’m on the old 3G $20pm contract. What happens to that now?? You’re free to choose to remain on the 3G plan and continue to use the 3G network. If you wish to move to the 4G network, you’ll need to select a current plan.